This post is part of a series on problems I’ve encountered with financial advisers and my day 4 blog post for the #YourTurnChallenge. One of the problems that I have experienced with financial advisers is their quickness to judge me and failure to understand my point of view. When evaluating an adviser, I look for someone who offers insights on complex financial problems. I don't mind being pitched an off-the-shelf product but want to hear why it's ideal for my unique circumstances. I shy away from those who seem to force an ill-fitting solution as appropriate for every situation (and demean me if I disagree). Some professionals have limited toolboxes (and patience). Possibly as a result, customers are taken through a sales funnel that ends with a predictable product recommendation. In a memorable meeting a while back, I was working with an financial adviser who had sold me a financial product well-suited for my needs. This person was generally kind and concerned about each client's long-term financial success. To be of service, he often initiated meetings to discuss needs, not necessarily push a specific product. During one of these sessions, I mentioned that I had purchased a catastrophic health insurance policy, not a more comprehensive one. He quickly made a recommendation and dismissed my decision as stupid. I think most people know that customer's decisions shouldn't be called stupid. I respected this person, but I couldn't bring myself to continue meeting with him. I suppose I could have just called him out on his unwelcome remark. But I didn't. As an introvert, I perceived trying to explain my thought processes to other people who believe they're smarter than me as an insurmountable task. Since then, though, I've learned to patiently explain my reasoning to those who are willing to listen. For a brief period, my husband and I were self-employed so we needed to get private health insurance (in the years before the Affordable Care Act's Catastrophic Health Plans were developed). We had enough money to pay for regular visits, which happened to be very infrequent at the time. For example, we visited our physician yearly. And, honestly, in one 20-year stretch, I only saw my physician about 5 times outside of this annual visit and received an antibiotic once during that time. No one in our family took medication on a regular basis. So, it made sense to me to purchase an inexpensive catastrophic health insurance policy, rather than a pricier but more comprehensive plan. It was unlikely that we'd outspend our deductible. But we did want to make sure we were covered if a family member was in a major accident or developed a chronic or difficult-to-treatment illness. The idea of purchasing health insurance on the open market was a relatively novel idea at the time. And I had more experience with this process than many people. I had accepted COBRA coverage for a brief period when I changed jobs, years before this conversation. The monthly payment was staggering, over $500 back in the 1980s. So, to get family coverage for half that amount many years later didn't seem stupid to me. Certainly, I understood that our personal situation could change. And that we could possibly benefit from more comprehensive coverage later. In fact, we did switch when the insurer stopped offering this policy in our state. 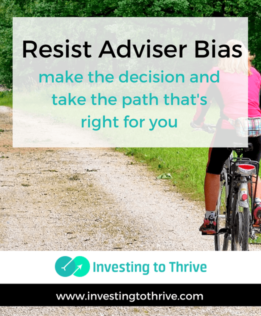 A survey by TradeKing Advisors indicates that many people won't meet with an adviser for fear of being judged. My experience tells me that this fear is not irrational. Sales representatives in the financial industry may be very product focused, especially if they earn commissions on specific products and not general fee-based advice. Some are trained on a company's products and services as well as coached on methods of presenting features and benefits, and dealing swiftly with customer objections. Their goal is to build trust and sell what they've been told is in their customer's best interests. Sadly, they may begin to believe that any other point of view is foolish. They may not stop to consider the viability of the customer's other choices; and even if they do, they may view these choices from the company's lens not the customer's perspective. Some understand and apply financial concepts superficially. They may try to keep up with the latest offerings but don't seem to grasp or acknowledge foundational principles. For example, I believed that insurance should cover expenses that I couldn't reasonably cover myself. But the trend at the time was to buy insurance to cover ongoing usage with the assumption that everyone needs medical interventions on a regular basis. More recently, overuse of medical services has been recognized more widely as a problem and the value of catastrophic health insurance, more commonly understood. As another example, investors may be told that ETFs are more tax-efficient than mutual funds. Mutual funds make pass-through distributions so an investor could possibly owe taxes because of capital gains on securities sold by the fund company (not the individual investor). ETFs operate differently. Still, the tax-efficient aspects of ETFs typically won't matter if investments are held inside of a tax-advantaged account. Knowing the rationale of a statement is useful to making a sound decision. Learning the rationale may be time consuming and may slow down thought processes. For me, though, being able to apply foundational concepts to financial plans has been useful. A good adviser can withhold judgment long enough to understand the nuances of my situation (if any) and devise an approach that is best for my immediate and longer-term circumstances.